서명/저자 Quality of Work in the European Union : concepts, data dna debates from a transnational perspective / ed.by Ana M. Guillen ; Svenn-Age Dahl. 발행사항 New York : P.I.E. Peter Lang , 2009. 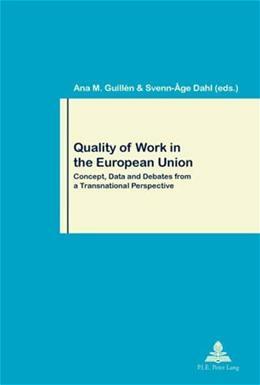 This collective volume on quality of work in the European Union offers a comprehensive analysis on the current situation of the tensions between work and welfare in Europe, with a special emphasis on employment-related issues. The volume tackles a crucial aspect of employment policies, namely the strengthening of the quality dimension in the decisions taken by policy-makers to foster the performance of the labour market and to combine this orientation with the demands of workers for welfare, protection and a better reconciliation of work and family life. Quality of work has been on the agenda of policy-makers, practitioners and academics for the last few years, promoting a wide debate. The book provides a contribution to this debate and takes into consideration a range of issues associated with the analysis of work quality from an innovative perspective. Relevant subtopics including a conceptual and political analysis of work quality, wage differentials and in-work poverty, gender issues or workers'' direct and indirect representation in the firm and its relation with work quality are addressed.